Know What Kind Of Oil Need To Sharpen Your Japanese Knife ? Knives can be sharpened with stones, sharpening steel and various other products available in the market, but the oil assures that your blades stay protected, polished and safe for use. Oils are usually associated with lubricating, moisturising and restoring shine. This is why, we use them for cooking, in our body and hairs. Similarly, the usage of oil can smooth and disinfect many tools and machinery. Here, we are going to discuss the kind of oil that are used to sharpen the Japanese cutleries. A Japanese kitchen knife is characterized by the toughness and longevity of the blade. This makes it possible to sharpen the blade very thinly and use it for a long time. Traditional Blades and Japanese Knives are made of carbon steel and the main problem of these steel is it rusts. Protecting the knives from rusting is essential not only for the health but also for aesthetic reasons. Japanese Knife Maintenance is quite easy owing to a wide range of products available in the online stores. Though Japanese blades are known for durability and sharp edges it has a tendency of getting dull edges. The Camelia Oil also known as Tsubaki oil is used to apply to your carbon knives in order to prevent them from oxidizing. Not only does Camellia Oil work well on knives and tools for protecting rust, but you can also use it for restoring shine and sharpness into your blade. Tsubaki is actually a Japanese wood described as the Camellia japonica and the oil derived from this wood is non-toxic. If applied on high carbon tools, it can help you to protect and maintain the longevity by creating a membrane of the surface of the metal. This knife maintenance oil was very found among the samurai warriors and they used it for protecting and cleaning the swords. It was a well-kept secret until people became luckily got the chance to avail products online. Using it is also very easy as you need to either spray the oil and use it in drops. 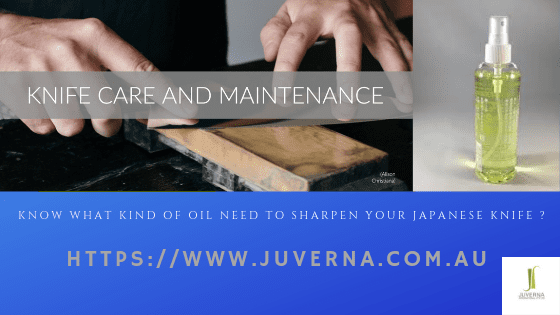 How To Use Camelia Oil To Sharpen Your Japanese Knife ? You can also apply the oil on your blades in dots and clean the rust using a soft clean towel. To remove the traces of the oil wash the knife under cold water before using. In case you are looking forward to shopping the best and effective camelia oil to keep your Japanese Knife set, sharp and rust free, visit https://www.juverna.com.au and search for your desired product. Subscribe our Newsletter Get 10% Off first purchase! What is Emu oil and how it benefits for skin?